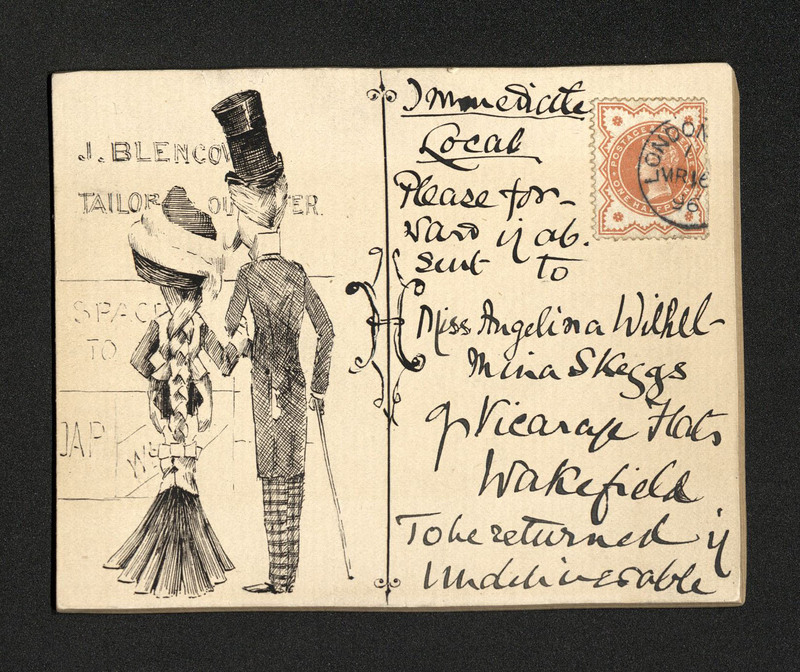 On this day, 145 years ago, the British public were first introduced to the postcard. As eagerly anticipated as the latest technology upgrades are today, 75 million were sent in the first year alone. Original postcard design – no exactly the most thrilling thing to receive in the post! 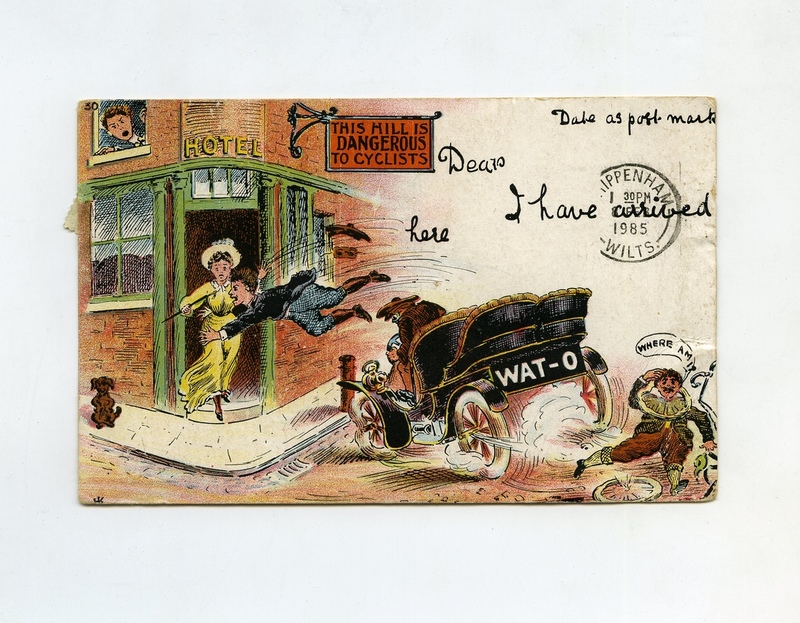 By 1890 both publishers and the public were eager to make better use of the postcard. They suggested the introduction of a divided back, in other words, confining the address, if wished, to just a half of a side freeing up the rest of a card for a drawing or a longer message. Eventually the Post Office agreed on the condition that any extra designs or remarks did not “Lead to any practical embarrassment of the Officers of the Post Office” and so in 1894, the picture postcard was born. Soon cartoons and photographs adorned the fronts of postcards which were now very much the piece of social mail that we know today. With the turn of the new century in 1900 the craze for sending and collecting postcards went into overdrive. 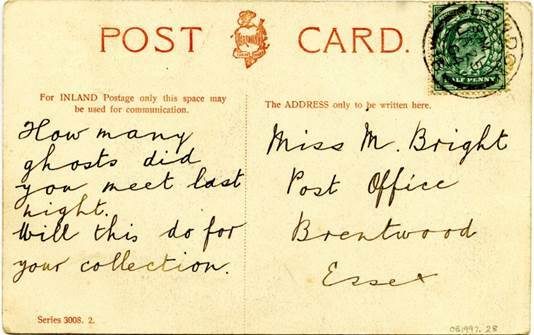 From country landscapes to cheeky seaside scenes, from political cartoons to photographs of major events the picture postcard was used the country over to share news, opinions and events, broadening people’s knowledge of the country and the world. Postcard printed with a comedic scene of a man crashing his car. Reverse is stamped and bears a message addressed to Miss K. Jenkins. Postmark on reverse is 1905, but on the front the postmark is 1985. Whilst a picture might paint a thousand words, the messages on postcards were still an important aspect. As an open form of communication postcards can be fascinating objects. Looking back at postcards written decades ago the messages they carry can often seem cryptic if you were not the sender or receiver. For example, one postcard in our collection sent to Miss M. Bright just says ‘How many ghosts did you meet last night. Will this do for your collection’ My imagination immediately conjures up a scene whereby Miss Bright is an Edwardian ghostbuster! The impact of the postcard as a more open form of communication is still felt today, whether we realise it or not, in the many texts and tweets we send around the world. But people also developed a myriad of ways to convey messages privately on postcards that the interested eye of the postman wouldn’t see. This could be through the message itself, written perhaps in mirror writing or in a coded alphabet, or sometimes in an adaptation to the postcard itself. For example many people starting ‘tilting’ the stamp, leading to many variations known as The Language of Stamps. As with the Language of Fans the position of the stamp could convey a plethora of meanings, from ’I love you’ to ‘I don’t want to see you again’, it was adapted many times over. 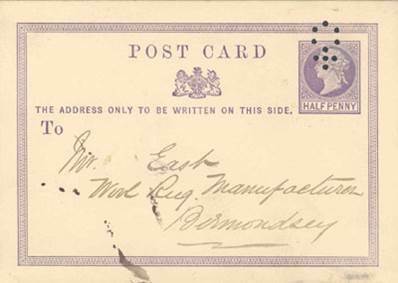 I hope this brief outline of the origins of postcards 145 years ago will inspire you to keep sending postcards to friends and family across the world and perhaps next time you send one, you’ll tilt your stamp or use your own secret message. This June not only marks the 60th anniversary of Her Majesty Queen Elizabeth II’s coronation on 2 June 1953 but also 175 years since another female British monarch was crowned; the young Victoria became Queen of the United Kingdom on 28 June 1838. Both queens have celebrated a Diamond Jubilee and are the United Kingdom’s longest serving monarchs – a remarkable achievement, which is also reflected in the eventful periods that mark their reigns spanning over decades of the 19th, 20th and 21st centuries. Victoria oversaw a whole era of innovation, which was particularly true in postal affairs. 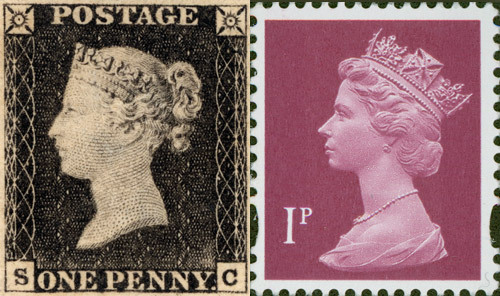 The world’s first postage stamp, The Penny Black, was issued during her reign on 6 May 1840 and featured the young queen’s portrait. 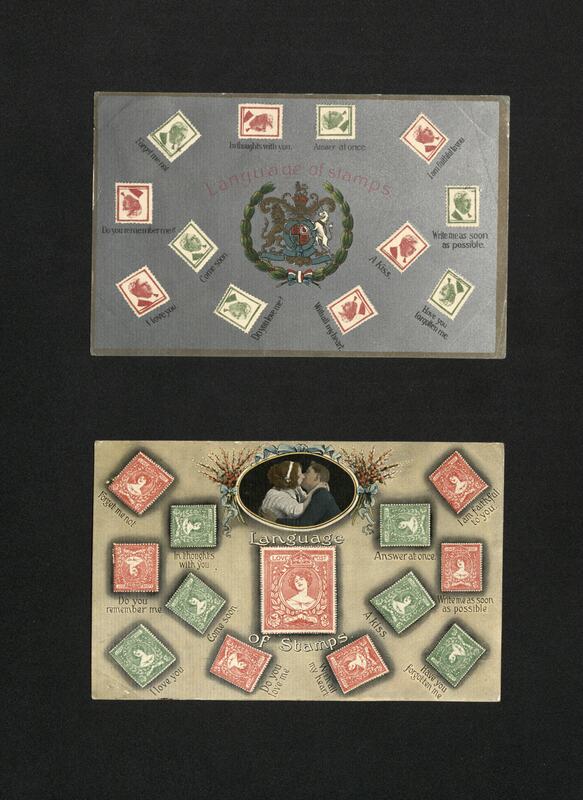 The Penny Black and “Machin” stamp designs. Since Queen Elizabeth II’s ascension to the throne in 1952, many ground-breaking changes have taken place in every part of British life. In stamp design, the Queen’s head was almost removed from pictorial stamps but finally a new timeless and classic design was finally commissioned for definitive stamps: the “Machin stamp”, featuring Queen Elizabeth II’s effigy. Based on the white cameo relief created by Arnold Machin this iconic design has been reproduced on stamps over 200 billion time since 1965. To commemorate these two extraordinary anniversaries, the British Postal Museum & Archive Shop is now offering a unique set of Wedgwood Jasperware plates featuring the two classic portraits of Queen Victoria and Queen Elizabeth II from stamp design. 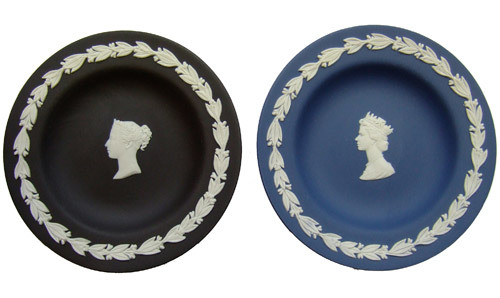 A Black Basalt plate shows Queen Victoria’s portrait from The Penny Black, and a Portland Blue dish features Queen Elizabeth II’s image from the “Machin Head”. The plates are 11cm in diameter with a white wreath of laurel leaves on the border and come beautifully presented in a Wedgwood box. You can now purchase this ideal souvenir of the coronation anniversaries in 2013 as a set for £17.50 from the BPMA online shop (plus P&P).